Stoelman Papierrecycling is a leading, global company boasting 100 years of experience in the waste paper and cardboard sector . Over the years, we have expanded our network and we have established many consolidated business relationships with other companies worldwide. The history of Stoelman Papierrecycling dates back to 1914. 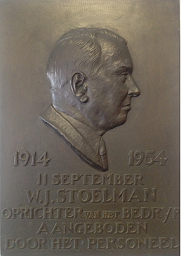 In that year Mr. W. J Stoelman started a small waste paper trading company having mainly local printing businesses as suppliers and clients. In the years to follow the company grew from a local collector of waste paper to a company of an International standard, active worldwide. Apart from being specialized in the trading of various grades of waste paper, our company also focusses in the trading of cellulose/pulp and second choice new paper and cardboard. We are proud to say that Stoelman Papierrecycling is renown for its important position in the National and International paper and cardboard industry. Since the beginning of the 21st century, our company has traded over 100.000 tons of waste paper on a yearly basis. Our clientele includes the paper and cardboard industry, printing industry and many other companies active in the recycling industry. Thanks to our know-how, built up over the years, and with our renown expertise in the field of paper, we have become one of the most leading companies in our sector. What we are also proud of is our extensive business network. Thanks to our dedication, commitment and flexibility, over the years, we have built up many consolidated business relationships with waste paper traders and recycling companies; some of these relationships date back to more than 50 years. With the right contacts in the paper and cardboard industry, we can offer our customers an even better and more personalized service. Are you interested in receiving more information about our company and activities? Or are you looking for an experienced and reliable business partner? Please do not hesitate to contact us by mail (office@stoelman.nl) or call us (+31(0)23-5319357) and we will do our utmost to meet your individual requirements.